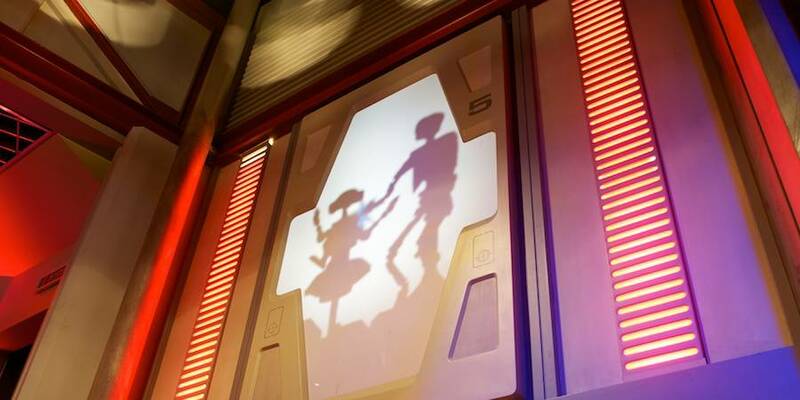 Sector Two is Star Tours’ droid repair facility. Hundreds of damaged droids are scattered throughout the multiple levels, and it is up to a handful of G2 droids to get them back up and running. While most visitors to Star Tours are familiar with the goose-like G2-9T and G2-4T, it is less well-known that a third G2 also works for Star Tours. This anonymity is partly due to the fact that an unfortunate welding accident led to the near-total destruction of the original goose-like body of G2-3B. Three-Bee’s memory core was salvageable, however, so his personality and programming were uploaded into the first convenient droid shell, in this case, an EV model whose original personality had turned destructive and had to be totally wiped. G2-4T and G2-9T tend to be talkative, and waste the majority of their time speaking to the tourists. To escape the constant chatter from the other two, G2-3B locked himself in the next room where he can concentrate on his tasks. And one of those is fixing an early-model RX unit. Their silhouettes can be glimpsed occasionally whenever Three-Bee uses his welder to effect repairs… an activity he no longer trusts to Nine-Tee. Parts of this entry are from the Imagination of Alex Newborn.